Over 5.6 million people have fled Syria since 2011, seeking safety in Lebanon, Turkey, Jordan and beyond. Millions more are displaced inside Syria and, as war continues, hope is fading fast. UNHCR works hard to help, leading a coordinated effort across the region. Together with our partners, NGOs and host governments, we offer a lifeline to those in need. Millions of Syrians have escaped across borders, fleeing the bombs and bullets that have devastated their homes. Turkey hosts the largest number of registered Syrian refugees – currently 3.3 million. The vast majority of Syrian refugees in the neighbouring countries live in urban areas, with around only 8 per cent accommodated in refugee camps. In Lebanon, life is a daily struggle for more than a million Syrian refugees, who have little or no financial resources. Around 70 per cent live below the poverty line. There are no formal refugee camps and, as a result, Syrians are scattered throughout more than 2,100 urban and rural communities and locations, often sharing small basic lodgings with other refugee families in overcrowded conditions. "They gave us biscuits, cheese, dates, dry meat – all very nice... And they gave us mats, blankets and kitchenware." In Jordan, over 655,000 men, women and children are currently trapped in exile. Approximately 80 per cent of them live outside camps, while more than 139,000 have found sanctuary at the camps of Za’atari and Azraq. Many have arrived with limited means to cover even basic needs, and those who could at first rely on savings or support from host families are now increasingly in need of help. It is estimated that 93 per cent of refugees in Jordan live below the poverty line. Iraq has also seen a growing number of Syrians arriving, hosting more than 246,000, while in Egypt UNHCR provides protection and assistance to more than 126,000. But although life in exile can be difficult, for Syrians still at home it is even harder. "We felt maybe it's our turn to die. But we didn't want to die. So we made up our minds to leave." We provide life-saving humanitarian aid for Syrian refugees, helping the most vulnerable with cash for medicine and food, stoves and fuel for heating, insulation for tents, thermal blankets and winter clothing. For those who have been displaced but remain in Syria, we provide shelter kits and non-food items as well as protection services and psychosocial support. 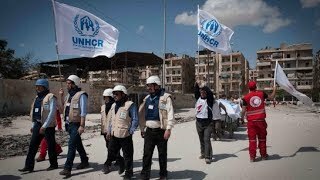 In early 2017, with Syria's war heading into its seventh year and with no end to the fighting in sight, we joined forces with other United Nations humanitarian and development agencies to appeal for US$8 billion in vital new funding to help millions of people in Syria and across the region. The first aspect of the appeal is the Regional Refugee and Resilience Plan (3RP) for 2018-2019. Led by UNHCR, it calls for US$4.4 billion to support over 5 million refugees in neighbouring countries and some four million people in the communities hosting them. The second aspect is the 2017 Syria Humanitarian Response Plan, which seeks nearly US$3.2 billion to provide humanitarian support and protection to 13.5 million people inside Syria. "Syria is the biggest humanitarian and refugee crisis of our time, a continuing cause of suffering for millions which should be garnering a groundswell of support around the world." To find out more about our work in Syria, please visit the UNHCR Syria website.